An eagerly-awaited report from Florida’s insurance consumer advocate confirms that personal injury protection (PIP) costs have skyrocketed throughout the state, but offers no ready-made solution to the problem. Robin Westcott, who was appointed to the post in July, has vowed to come up with solutions to escalating premiums that officials say threaten to sink the state’s no-fault auto insurance system. She formed a working group of legislators and regulators to do that soon after taking office. The report produced by that group says that, while the number of drivers in the state has risen only slightly and the frequency of vehicle crashes fell more than 20 percent–from 1.96 to 1.52 for every 100 motorists–over the last decade, insurer’s direct losses on PIP claims climbed from $1.3 billion to $2.3 billion over the same period. Insurers, state officials and industry experts say inflated claims, accidents staged in order to obtain payments and other misuses of the system are out of hand. The annual number of reportedly staged crashes climbed from 1,258 three years ago to 2,779 in 2010—a 55 percent increase—according to statistics provided by the National Insurance Crime Bureau. Increasing insurer costs have translated into higher policy rates for Floridians, making it difficult for residents of the Sunshine State who are browsing car insurance quotes online to find affordable coverage. Florida is one of a dozen with so-called “no-fault” systems that are designed to reduce the need for motorists to file lawsuits to cover injuries resulting from accidents. Florida law requires drivers to carry a minimum of $10,000 in PIP coverage, which covers policyholders up to that limit regardless of who caused the accident. According to a report from the Insurance Information Institute (III), Florida insurers are being forced to pay 70 percent more each year to cover bogus accidents and other costs. An III report released earlier this year found that the $10,000 PIP minimum has become a “dollar target” aimed at by those looking to game the system. 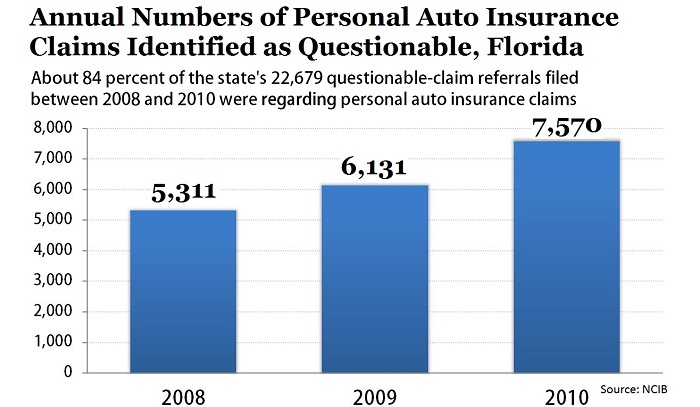 Questionable claims reported by Florida insurers increased by 42 percent from 2008 to 2010, the NICB reported in March, with 84 percent of those bogus claims being made for personal auto coverage. NICB reports as questionable those claims that are referred to it by member insurers for review and possible investigation. According to data included in the report from Westcott’s group, families in Tampa who have policies that include two teenage drivers saw their policy rates climb to $1,997 this year from $1,279 just three years ago. And a young professional in that city now faces premiums of $1,077, more than double the $438 that person would have paid in 2008.